I’m back analyzing Northern New Jersey playgrounds, but this time I not only have good things to say but a “higher” reason to say them. Believe it or not, there are some people in my family that still pay attention to the pics of my son I furiously email them on weekends. One of those family members is my mom, who’s one of the most talented architects in Fortaleza, Brazil. She happened to see a previous pic we took at the Lyndhurst Town Park and was intrigued at the sustainability of their Vortex water park. She ended up pitching it to a client and the client loved the idea, so she “commissioned” me to take more pics and investigate a bit further. The rest of this post, as well as the descriptions in the album below are in Portuguese, for her. De acordo com o pessoal da manutencao do parque, aproximadamente 90% da agua utilizada acaba sendo reutilizada. Os jatos d’agua foram desenhados para que toda a agua caia sobre o chao absorvente, mas a parte mais importante da absorcao eh feita pelo ralo central. A depressao do parque encaminha a agua para o ralo, que despeja a agua em um tanque situado ao lado do parque. Desse tanque, a agua passa por um filtro, e do filtro volta para o parque. Eu acabei tirando fotos do playground que fica bem ao lado do parque aquatico. Esse playground tambem utiliza um chao de borracha, muito absorvente, que ajuda a reduzir trauma caso as criancas caiam no chao. Esse chao eh muito comum em parquinhos aqui em Nova Jersey e em Nova Iorque, mas eu nao tinha visto na Carolina Do Norte. Para ver as fotos em RESOLUCAO ALTA, clique na rosca no canto direito superior da imagem e clique em “VIEW IN FULL RESOLUTION”. 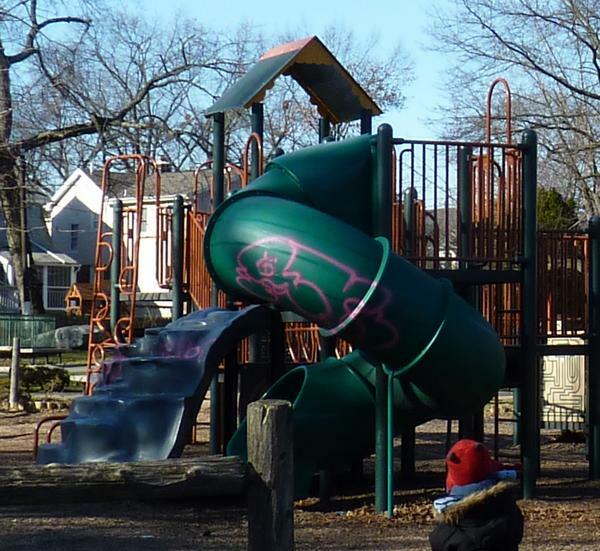 P.s – The Lyndhurst Town park is our 2nd favorite park in the entire NJ/NY area. It’s by far the cleanest and safest, and in our opinion, loses only to Hoboken. Hoboken’s pier park deserves a post of its own, soon, and it currently ranks #1 in family entertainment.